With hope and promise in the backdrop, reforming a flawed criminal justice system is a work in progress. 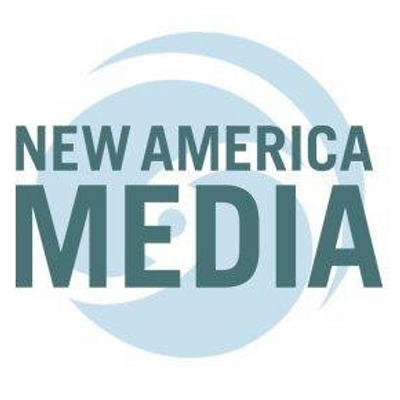 Currently, the American justice system holds more than 2.3 million people in its correctional facilities, according to the Prison Policy Initiative. 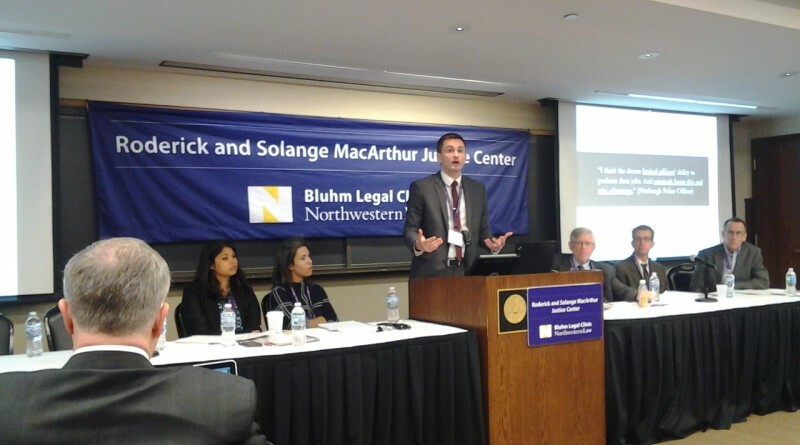 On April 14-15, attorneys, professors, experts and advocates assembled at the Bluhm Legal Clinic, Northwestern Pritzker School of Law, for the Roderick and Solange MacArthur Justice ‘De – Incarceration Through Civil Rights Litigation’ conference. Each participant received a copy of “A Question of Freedom: A Memoir of Learning, Survival, and Coming of Age in Prison” by the keynote speaker of the event, Reginald Dwayne Betts. From the welcome remarks to the facilitated panels, the conference accomplished its mission of giving the incarceration issue more context. During the Mass Imprisonment: Defining the Problem and Identifying Solutions panel, Marc Levin, Policy Director of the Texas Public Policy Foundation, Right on Crime, compared the American and German justice systems. 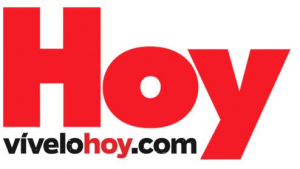 “Do you want to get even or do you want to get results?” said Levin in regards to the American prison system. Germany, which has a tenth of the crime of the United States, gives it prisoners freedom of movement, freedom of choice and personal responsibility, Levin noted. There prisoners function like an ordinary society. The system is also producing results while spending less money on prisons and releasing prisoners who are rehabilitated more back into society, Levin added. In stark contrast, the United States spends an excess of $80 billion each year on incarceration, according to the American Civil Liberties Union. During the Litigating Race panel, Dr. Andrea Armstrong, Associate Professor of Law at Loyola University-New Orleans College of Law, described the role data plays when thinking about incarceration and race. “If we don’t ask what this data means, and who we are getting it on, we missed one of the biggest ways to change what’s happening,” said Dr. Armstrong. Dr. Armstrong also explained the lack of data in certain areas of incarceration and race. “There’s virtually no data on job assignment within a prison, as it relates to race of the person in the prison,” said Dr. Armstrong. She concluded by saying there is no data in regards to the ways race can influence the disciplinary decisions, an opportunity where race can be even more significant. The most poignant moments of the conference involved the effects of the flawed juvenile justice system. Theodore Shaw, who spoke during the Bringing them Home after the Scandal panel, was a defendant in the notorious Jena 6 case, where six African American Louisiana high school students were charged with attempted murder after a fight sparked by a racist incident. 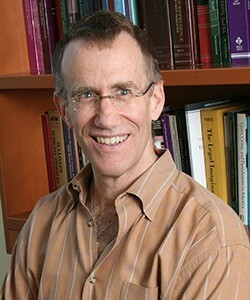 Shaw is now a first-year law student and Gates Public Service Law Scholar at the University Of Washington School of Law. It was so inspirational to see how Shaw persevered after the Jena 6 trial changed his life. Shaw was also passionately excited to start his first year of law school. He explained how the Jena 6 case would have been handled more differently. “Adults had an opportunity to come together to address the problems,” said Shaw. Reginald Dwayne Betts, Keynote Speaker, Juvenile Justice Reform Advocate and Award-Winning Author of “A Question of Freedom: A Memoir of Learning, Survival, and Coming of Age in Prison” (Photo by Joshua Conner). 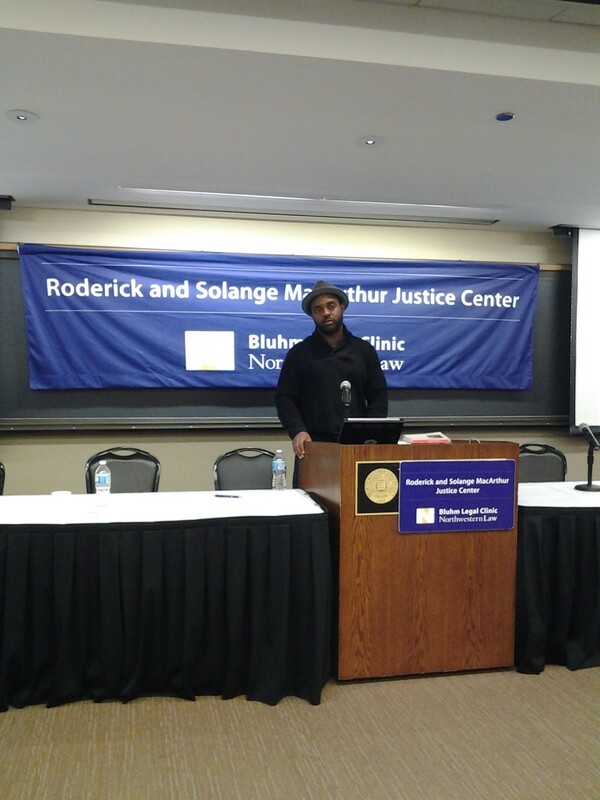 Keynote speaker Reginald Dwayne Betts also survived the flawed juvenile justice system. Betts is a juvenile justice reform advocate and the award-winning author of “A Question of Freedom: A Memoir of Learning, Survival, and Coming of Age in Prison.” Betts has a unique passion for poetry and storytelling, and he explained how their letters and advocacy work show the true stories of many prisoners. “Their life is much richer than their litigation presents,” said Betts. Jur. 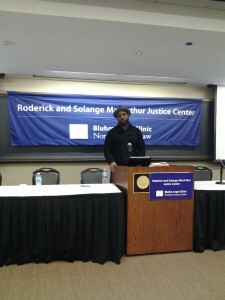 Locke E. Bowman is the Executive Director for Roderick and Solange MacArthur Justice Center for Chicago, New Orleans, Mississippi and St. Louis. D. Jur. Bowman gave the welcome remarks, and participated on the Police Accountability and De-incarceration panel. He noted how the center’s work has changed in the past 30 years. He noted that the 1994 federal Crime Bill “was all about the idea that you should be tough on crime. That there was no violation small enough not to warrant an excessive response. So I don’t like to be overly optimistic, but certainly serious transformations” have occurred, Bowman said. Bowman also explained how litigation and activism go hand in hand. “I think that the effect of the movements on the ground, Black Lives Matter among many others have been enormous in that it provides us who do civil rights litigation with a tool,” he said. Joshua Conner was a SJNN Cycle 1 Fellow, focused on the impact of the war on drugs on Chicago communities, including controversial drug sentencing policies, alternative sentencing, racial profiling, treatment/ rehabilitation and violence connected to the drug trade. You can follow Joshua on Twitter at @MrJoshConner.